Reflects the timelessness and mystique of the Orient. A delicate sleek shape that is as beautiful as it is durable. Image shown in Beige Travertine. NOTE: Due to variance in natural materials, color and veining will vary. Image shown in ﻿Beige Travertine. Don't use vinegar or cleaners that contain acids...such as tile, tub, toilet and grout cleaners. Don't use powder cleansers, soft cream cleansers (SoftScrub, etc. ), mildew/mold removers (TileX, X14, etc. ), disinfectants (Lysol, etc.) or abrasive nylon scrub pads. - There are available safe disinfectants that have been formulated that can be used around and on stone surfaces. Don't use furniture polish (Pledge, Jubilee, Endust, etc.) on stone surfaces. 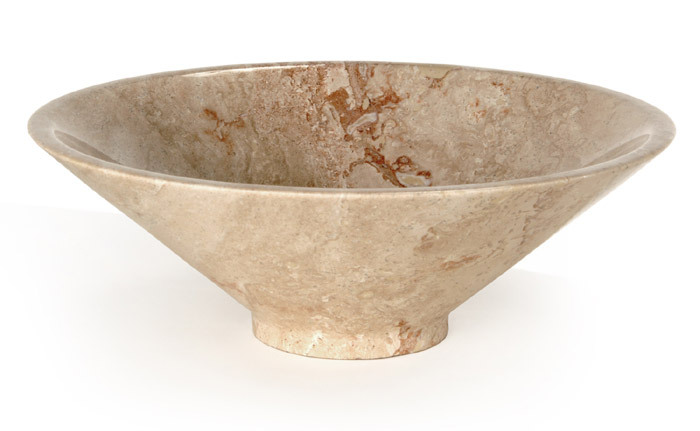 Use a stone polish; this will help minimize staining and etching on furniture, counters and vanities. Don't use the cork and wood container protectors. These can cause severe stains. MARBAMIST...Counter/Vanity/Table Top Stone Spray Cleaner A ready to use stone cleaner. It is a gentle premixed formula. Just spray it on wipe it off. This is USDA authorized and is ideal product for the kitchen to cleanup grease and as a general purpose cleaner this product is pH7 balanced. SPRAY-N-SEAL.Prevents Staining and Discoloring A water based penetrating sealer that protect natural stone surfaces from staining. It is wonderful for stone countertops, floors, walls, vanities and even grout. This below surface sealer is also ideal for sealing all types of masonry, stucco, concrete and sanded grout. It has a special blend of polymers that bond to the stone and creates a water and oil repellent membrane to prevent staining, yet it allows the stone to breathe and release moisture vapors. It is safe for interior and exterior use and is UL Classified for slip resistance. This stone sealer will not alter the color of any stone, tile or grout.